Are you a fan of jazz? Consider attending the Savannah Music Festival this fall! Presented by the Coastal Jazz Association, this annual festival celebrates America’s only indigenous art form – jazz! You’ll hear all different types of jazz, from traditional swing to funky down-home blues, played by some of the most accomplished musicians in the world. This year’s event will take place from September 18 – 24, 2016, and it’s free and open to the public. Here are some of the things you’ll see at the 35th Annual Savannah Jazz Festival. The Charleston Latin Jazz Collective: Performing at the festival on Wednesday, September 21 is the Charleston Latin Jazz Collective, the region’s number one Latin dance band. This ensemble showcases the Cuban influence on jazz music and has played big roles in that genre, both regionally and internationally. Their funky tunes will have you dancing in no time! King Solomon Hicks: A jazz and blues guitar prodigy, King Solomon Hicks is just 21 years old and has already played with legendary acts like Tony Bennett and the B.B. King Blues Band. He is often referred to as “Little B.B.” and will headline the festival’s Blues Night on Thursday, September 22. Barry Greene: Guitarist Barry Greene is the Friday night opener for this year’s festival. He’s a fantastic performer and is also a professor of jazz studies at the University of North Florida. He’s even a published author on jazz instruction. Barry Greene performs all over the United States and is considered one of the country’s finest jazz guitarists. Dave Stryker: Dave Stryker has recorded an incredible 26 albums, and his latest went to #1 on Jazz Week Radio. Be sure to check out his amazing festival performance on Saturday, September 24th. Head to the festival website to view the full lineup and performance schedule. The Savannah Jazz Festival concerts are held at multiple locations throughout the city, and many take place in Forsyth Park. 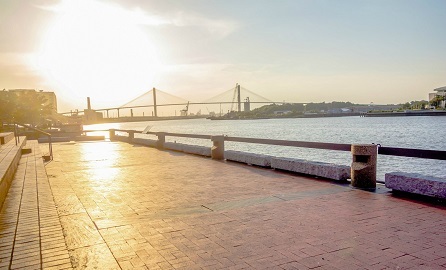 This historic 30-acre park has been a staple in Savannah since the 1840’s and features walking paths, a café, a children’s area, and tennis and basketball courts. It’s also home to an iconic fountain and many beautiful statues. Be sure to spend some time strolling through the park while attending the festival! Less than a 10-minute drive from Forsyth Park, the Presidents’ Quarters Inn is the perfect place to return to after an awesome concert. 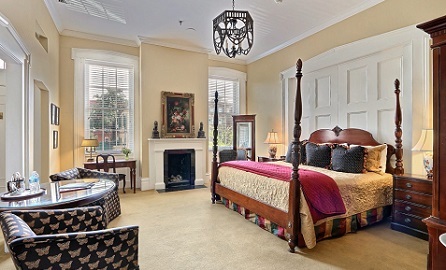 Our Savannah bed and breakfast offers 19 beautiful rooms and suites where you can rest and unwind. We also have a lovely selection of afternoon cocktails and hors d’oeuvres to enjoy in our dining room or alfresco in the courtyard. 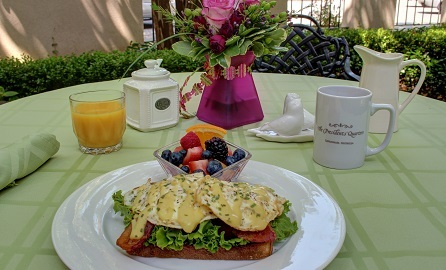 In the morning, join us for breakfast and tell us all about your experience at the Savannah Jazz Festival. We look forward to seeing you in Savannah this fall! For more information on upcoming events, including the Savannah Food and Wine Festival and the Savannah Film Festival, request a copy of our free Savannah vacation guide.